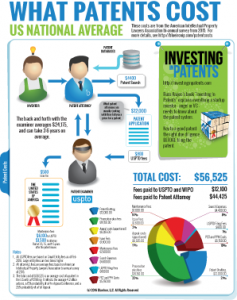 How much does a patent cost? The US average is about $12k, but the total cost of a patent is closer to $60k. Have you been quoted much less? There are plenty of patent attorneys who quote much, much less than $12,000 to draft a patent application. But beware. One of the standard practices is to quote a much lower fee to draft the patent application, but make it all up with the back-and-forth with the patent examiner. Some attorneys will quote as little as $2000 to $6000 to write a patent application. But don’t be fooled. The dirty little secret is that the worse the initial patent application is, the more money the patent attorney can make by all the “patent prosecution,” which is the arguing between the attorney and the patent examiner. A typical US patent costs around $60,000, according to data from the American Intellectual Property Legal Association bi-annual survey. This is the average cost across the US for a patent on a “high technology” invention, and your mileage may vary. This price is highly variable – sometimes it will be less, and sometimes much, much more. For a financing solution that makes the fees predictable and uniform, see BlueIronIP. The patent costs are broken into drafting (“preparation”) and prosecution. Preparation includes everything until filing, then prosecution is everything from filing to issue. Preparation is understanding the invention, drafting the claims and the specification, and the odds and ends that need to be done to file the patent application with the US Patent and Trademark Office. Patent preparation costs should be $15K+ for drafting the patent application. This will include a very significant cost of learning your technology and your business goals, then crafting the patent application to match your needs. Patent prosecution costs will average about $20K. This will include going back and forth with the patent examiner, interviewing the examiner and, where applicable, the examiner’s supervisor, and going to appeal if necessary. Once there is allowable subject matter, the issue fee is paid and the patent is granted. There is a large variability in costs to get a patent. Some will issue quickly and not cost so much, but others may take a considerable amount of effort and cost to get allowed. BlueIronIP.com was created to address this specific need. BlueIronIP finances patents at a flat, monthly cost so that the patent expenses are fixed and predictable.